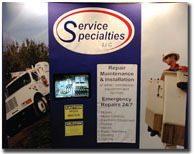 Since 2005, Service Specialties, LLC has been providing professional services for the water and waste water industries. The years of combined experience and professionalism the Taylor family brings to the water and waste water industries have earned Service Specialties the dedicated business of many water and waste water treatment facilities in Central Kentucky. Throughout the state of Kentucky, Service Specialties has earned a reputation for efficient, skilled and reliable service among municipal governments and private industries. Their talents in dealing with the many facets of equipment, facilities and materials supporting large capital investments in water resources are renowned. Service Specialties can help your municipal or private organization with all of your construction, routine maintenance or emergency maintenance needs. Service Specialties demonstrates a commitment to their clients by also offering 24/7 Emergency Services for those moments when critical components fail. So don't delay, give Service Specialties, LLC a call today and "sleep easy" knowing that all your needs and equipment will be in excellent hands!